Dreams inspired Soichiro Honda to create a company and they continue to inspire and challenge us here at HCM. From 8 cars a day in 1986 to 1,690 today plus 1,000 engines, we’re seeking talented, passionate dreamers to join our team. An exciting time is ahead at HCM, as you’ll hear from Bill Easdale, our Senior Vice President. Our founder, Soichiro Honda, understood the importance of people working as a team. At the center of the Honda philosophy is “Respect for the Individual”—a fundamental belief that each associate can explore and create his or her own dreams. The atmosphere that encourages associate involvement underlies our commitment to build the highest quality and most popular automobiles, engines, motorcycles and power products. Bringing together a team of associates with varied experiences and ideas is what defines the success of our team. HCM hires qualified people who understand the importance of working as a team. HCM is an equal employment opportunity employer and does not tolerate any form of unlawful discrimination. All employment decisions at HCM are based on merit and pursuant to the principle of equal employment opportunity. Honda ensures that hiring and promotion decisions are made in a non-discriminatory manner by imposing only job-related requirements for hiring and promotion opportunities. In keeping with both the letter and spirit of this policy, HCM will continue to recruit, hire, train and promote into all job levels the most qualified persons without regard to race, colour, religion, gender, sexual orientation, national origin, age, disability, veteran’s status or any other protected characteristic in accordance with appropriate law. Got talent? We have room. At HCM, we are seeking great talent to join our team. To check out what’s currently available, click here now. Here’s a quick rundown of the careers you can build at HCM. HCM is a manufacturer of cars, light trucks, engines and components. We’re known for bringing together diverse individuals with one shared goal. Our production associates have varied backgrounds with unique talents — that mix helps us to create quality products. HCM’s reputation for quality attracts the most talented professionals from across the country. While working as a team, each individual’s skills and experiences are drawn upon to create a dynamic environment that inspires us to build world-class vehicles. We have a number of different channels available for technical specialists to develop their careers at HCM – including from the production floor. We offer unique programs geared to build upon the skills and capabilities of new engineers and technical specialists. Our Engineering Development Program and Technical Development Program are the starting point for the development of our technical professionals. Our programs provide access to multiple manufacturing areas with state-of-the-art technologies. This valuable experience and training allows eager graduates the opportunity to grow their careers at Honda. Beyond the plant floor, there is a team of professionals that enable our production teams to be successful each and every day. Finance, Human Resources, Purchasing and Logistics, Information Services, Procurement and Medical and Safety professionals are among the diverse disciplines offered at HCM. HCM is proud to support students in their journey during their university and college careers. Each year, hundreds of students become part of the team. We begin recruiting in December/January of each year to ensure we have a great team in place to provide summer vacation relief. We seek individuals who are available from April/May to Labour Day in September. You should be able to work a two- or three-shift rotation along with any planned production Saturdays. You should be 18, and registered to a post-secondary school and have access to reliable transportation. We will consider former associates for re-employment. Former associates who are eligible for re-hire will be subject to our hiring and selection policies as are all applicants for employment. Questions about careers at HCM? We offer a competitive salary structure and a host of benefits that includes health care, dental, life insurance, disability and pension. Our Hondaflex program allows you to custom build a benefit program that meets your needs. Plus, you’ll have access to Honda purchase, parts and demo programs, an associate assistance program, tuition reimbursement, HCM team discounts, our onsite fitness facility, along with Living Well advisors, an NHL-sized ice rink, softball diamond, beach volleyball pits, outdoor tennis/basketball courts and workshop. Annually our associates enjoy two shutdown periods, generally falling around Canada Day celebrations and during the holiday season between Christmas and New Year’s. Our associates are provided with a subsidized, full-service cafeteria, (Wi-Fi enabled) along with our iconic white uniforms and safety shoes, glasses and other equipment to ensure their safety. Our overall success comes from invention and innovation. HCM provides incentive programs to recognize individual and team contributions, including a continuous improvement program, quality circles, and safety and quality awards program. Associates have had the opportunity to travel the world to present their ideas and bring home honours to HCM! Plus, as a team we like to celebrate the ongoing success of HCM. Our summer barbeque, annual holiday party and Christmas party for our kids are very special, allowing us to get together and spend time with our fellow associates and our families. At HCM we are associate driven! Through the effort of associates across our facilities, we are pleased to create quality products for our customers. 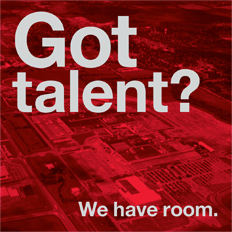 With four facilities across almost 900 acres, there are lots of opportunities. Here’s a quick snapshot of what happens inside the plant door. The stamping department provides stamped parts to Plant 1 and Plant 2. Steel coils are straightened and punched into blanks that are loaded into the press line. Two press lines, a four-press tandem press line and a transfer press line press, cut, and shape vehicle panels for both plants. Parts are formed using dies, which are made up of two parts: a top and a bottom. The press squeezes the two sides together to form the part. Steel that is cut away from the part drops below the presses and is collected by a conveyer. This steel is recycled. HCM associates inspect the parts as they are made to ensure high quality. Parts are then delivered to the Weld department. Sheet metal body and chassis components are cut and shaped using a series of presses. The welding process starts with highly sophisticated and programmable robots which seal and spot-weld sub-assemblies together. Additional parts such as the hood, doors, and trunk or tailgate are prepared in a separate hemming area. These parts, as well as the fenders, are then attached to the car body before it proceeds to the paint department. A special steel, called galvanneal, is used for exterior parts to prevent corrosion. 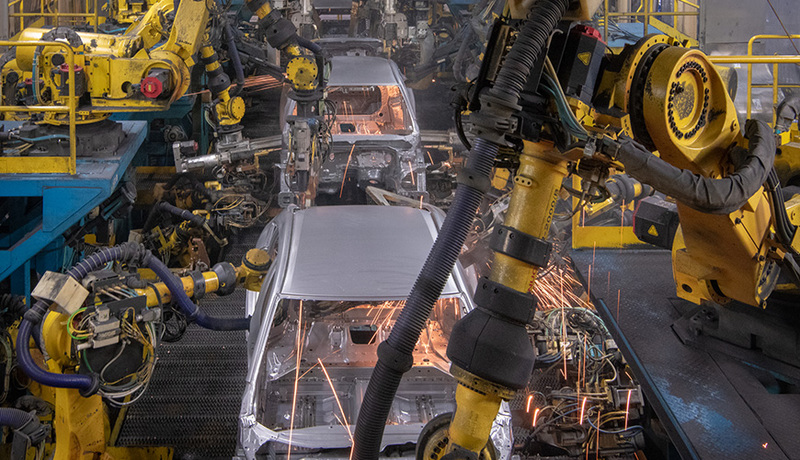 In the welding department, the steel panels from the stamping process and additional metal parts received from suppliers are spot-welded together using robotics and automation to form a precise, rigid body. Parts such as the hood and doors are then added to form the completed “white body”. The welded body is prepared for painting by passing through a series of dip tanks for cleaning, chemical pre-treatment, phosphating and electro-deposition coating for corrosion protection. This is followed by the robotic application of a sealer and a sound deadener. The body is then prepared for top coating by applying anti-chip primer and surfacer. The topcoat finish can consist of a base coat/clear coat, base coat/tinted clear or solid finish. All paint surfaces are applied robotically. After each coat of paint, the body passes through a baking oven. Bumper paint manufactures bumpers for the Honda Civic and CR-V, and receives unpainted bumpers supplied by a Canadian manufacturer for other models. After a cleaning process, primer, then base coat and clear coat are applied to the bumpers, with drying processes at each stage. This department brings the many sub-assembled parts together on the vehicle. Major and minor components are installed in the painted body; for example, the engine, seats and the instrument panel. Doors are removed from the vehicle shortly after it enters the assembly line and they are sub-assembled in a separate area. The doors rejoin the vehicle shortly before the end of the line. Assist devices, padded flooring and other features provide an ergonomically friendly environment. Mechanical, electrical, upholstered and other components including the engine are installed on the painted body in a carefully timed sequence as the vehicle is assembled. As the completed vehicle leaves the assembly line, this department tests the brakes and alignment, then drives each vehicle on an outdoor test track to check functionality as well as listen for squeaks, rattles and wind noise. After the test drive, the vehicle undergoes a water leak test. The finished product is moved to our distribution centre to be shipped to a dealer. Purchasing Division The purchasing division procures parts, equipment and supplies, as well as working with suppliers to ensure high quality and timely delivery. Administration Division This division includes accounting, information systems, human resources, communications, production control, facilities and safety and environmental functions. Quality Engineering Division The quality engineering division consists of the market quality and product engineering departments. New Model Division The new model division coordinates the smooth and efficient introduction of new models, as well as execution of full and minor model changes. These teams keep our operations running smoothly and support our production associates.